A very affordable small slim line storage unit for limited spaces. 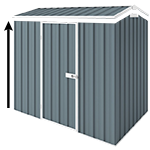 This colour YardSaver F44 garden shed is a very affordable small slim line storage unit perfect for limited spaces. It will perfectly fit under most eves and you will be surprised how much you can store in it. You can keep your mower and whipper-snipper in it and a lot of other gardening tools as well. Storage unit supplied with step by step assembly guide illustrated with pictures to make the installation a fun and easy project.